If you are interested in arts, this package is perfect for you. Even if you are not, you will be impressed by the traditional Japanese arts, the perfectly designed and manicured gardens, the architecture of buildings both modern and ancient, the beauty of the towns themselves and the contemporary arts in Shimane and Naoshima Island, not forgetting the art of nature itself. Board a train to Tsuwano, called ‘Little Kyoto in Sanin’. Explore the castle town, stroll around Tonomachi, the samurai district with stone paths, and see koi swimming in the waterways along the streets. Continue to excavate the charms of Tsuwano. Take a scenic chairlift up to the Tsuwano Castle Ruins and savour the panoramic castle town view, rich with nature. Make your way to Taiko Inari Taisha and venture through the thousands of tori gates before heading off to Hagi, another lovely little seaside castle town. Stroll around and explore Kikuya yokocho, Iseya yokocho, Edoya yokocho and see the samurai district in the Horiuchi area. Spend some time exploring the samurai residences. Don’t forget to check out the famous Hagi-yaki pottery! Move on to Yamaguchi, an ancient city called the ‘Kyoto of the West’, with many temples and shrines scattered across the city. Take a day trip to Akiyoshi, home to Akiyoshidai, Japan’s largest limestone karst plateau, and Akiyoshido, Japan’s largest and longest limestone cave. The art of nature is amazing. Explore Yamaguchi in the morning. Visit Rurikoji Temple, famous for having one of Japan’s three best pagodas, then relax and revive with a walk through Kozan Park. Enjoy the picturesque scenery featuring the excellent combination of the elegant pagoda and the delightful pond. Then head off to Okayama, famous for its beautiful, manicured garden, Korakuen, and Okayama Castle, known as ‘Crow Castle’ because of its black appearance. 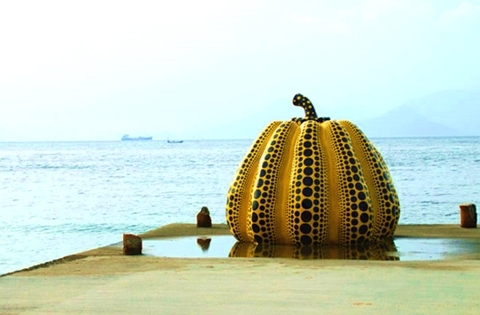 Board a ferry to Naoshima Island, known as an ‘Art Island’. Explore and discover your favorite arts at the many art museums across the island, including the unique ‘I Love Yu’ Sento, public bath museum, and Art House Project. Or just wander around the nostalgic island to discover its charms. Board a train bound for Kobe. Stop by Himeji to see the world heritage Himeji Castle, one of the most beautiful and spectacular castles of Japan. Explore the modern, fashionable city of Kobe. Stroll around the bay area or Nada Sake district, then visit and learn about the devastating Kobe earthquake at the Kobe Earthquake Museum. Don’t miss the opportunity to sample the famous Kobe beef for dinner before seeing the wonderful Kobe night view.